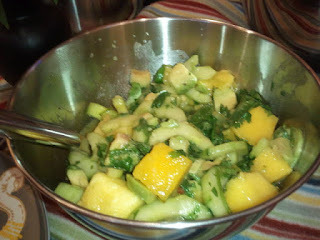 Livliga® Live Vibrant Blog: Tropical Cucumber Salad--Yum!! I love fixing a Tropical Cucumber Salad. This is a great summer salad. It uses wonderful fresh ingredients like mango, cucumber, avocado and cilantro. It is great for picnics. It is more like a fruit salad so it is a good complement to an all vegetable salad you might also serve. For our picnic I served both this salad and a Fresh Tomato and Pepper Salad. It is always a big hit. It is not the usual salad so it is one of my favorite stand bys to impress family and friends on a hot summer night. Each 1 Cup serving is 169 calories.